The Kinect for Windows has two sensors, an color sensor and a depth sensor. To enable independent acquisition from each of these devices, they are treated as two independent devices in the Image Acquisition Toolbox. This means that separate VIDEOINPUT object needs to be created for each of the color and depth(IR) devices. % The Kinect for Windows Sensor shows up as two separate devices in IMAQHWINFO. In order to acquire synchronized color and depth data, we must use manual triggering instead of immediate triggering. The default immediate triggering suffers from a lag between streams while performing synchronized acquisition. This is due to the overhead in starting of streams sequentially. Summary of Video Input Object Using 'Kinect Color Sensor'. Acquisition Source(s):  Color Source is available. Acquisition Parameters:  'Color Source' is the current selected source. 10 frames per trigger using the selected source. 'RGB_640x480' video data to be logged upon START. Grabbing first of every 1 frame(s). Log data to 'memory' on trigger. Trigger Parameters:  1 'immediate' trigger(s) on START. 0 frames acquired since starting. 0 frames available for GETDATA. Summary of Video Input Object Using 'Kinect Depth Sensor'. Acquisition Source(s):  Depth Source is available. Acquisition Parameters:  'Depth Source' is the current selected source. 'Depth_640x480' video data to be logged upon START. Set the FramesPerTrigger property of the VIDEOINPUT objects to '100' to acquire 100 frames per trigger. In this example 100 frames are acquired to give the Kinect for Windows sensor sufficient time to start tracking a skeleton. % start logging of acquired data. % Trigger the devices to start logging of data. The Kinect for Windows sensor provides different modes to track skeletons. These modes can be accessed and configured from the VIDEOSOURCE object of the depth device. Let's see how to enable skeleton tracking. % Get the VIDEOSOURCE object from the depth device's VIDEOINPUT object. The properties on the depth source object that control the skeletal tracking features are TrackingMode, SkeletonToTrack and BodyPosture properties on the VIDEOSOURCE. TrackingMode controls whether or not skeletal tracking is enabled and, if it is enabled, whether all joints are tracked, ‘Skeleton’, or if just the hip position is tracked, ‘Position’. Setting TrackingMode to ‘off’ (default) disables all tracking and reduces the CPU load. The ‘BodyPosture’ property determines how many joints are tracked. If ‘BodyPosture’ is set to ‘Standing’, twenty joints are tracked. If it is set to ‘Seated’, then ten joints are tracked. The SkeletonToTrack property can be used to selectively track one or two skeletons using the 'SkeletonTrackingID'. The currently valid values for 'SkeletonTrackingID' are returned as a part of the metadata of the depth device. % Turn on skeletal tracking. The skeleton data that the Kinect for Windows produces is accessible from the depth device as a part of the metadata returned by GETDATA. The Kinect for Windows can track the position of up to six people in view and can actively track the joint locations of two of the six skeletons. It also supports two modes of tracking people based on whether they are standing or seated. In standing mode, the full 20 joint locations are tracked and returned; in seated mode the 10 upper body joints are returned. 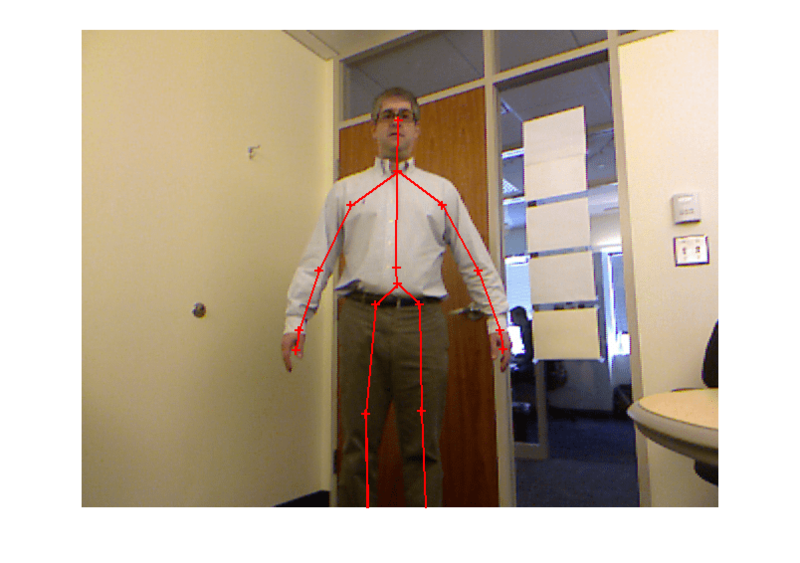 For more details on skeletal data, see the MATLAB documentation on Kinect for Windows adaptor. % Acquire 100 frames with tracking turned on. % Kinect for Windows to see valid tracking data. We randomly choose the 95th frame to visualize the image and skeleton data. The results above show that at least one skeleton is being tracked. If tracking is enabled but no IDs are specified with the TrackingID property, the Kinect for Windows software automatically chooses up to two skeletons to track. Use the IsSkeletonTracked metadata to determine which skeletons are being tracked. % See which skeletons were tracked. Display skeleton's joint coordinates. Note that if the 'BodyPosture' property is set to 'Seated', the 'JointCoordinates' and 'JointIndices' will still have a length of 20, but indices 2-11(upper-body joints) alone will be populated.